This flier (see PDF here) was passed out at the AMTA National Convention last week. Take a look! 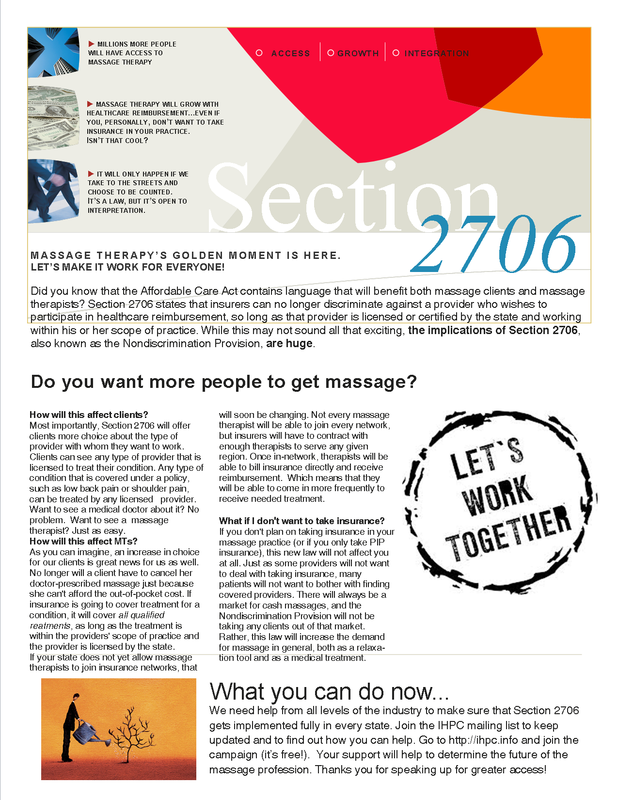 Massage Therapy’s Golden Moment: Making 2706 Work For Everyone! Did you know that the Affordable Care Act contains language in it that will benefit both massage clients and massage therapists? Section 2706 of the ACA states that insurers can no longer discriminate against providers who wish to participate in and be reimbursed by insurance policies, so long as that provider is licensed or certified by the state and working within his or her scope of practice. While this may not sound all that exciting, the implications of Section 2706, also known as the Nondiscrimination Provision, are huge. How will this affect clients? Most importantly, the Nondiscrimination Provision will offer clients more choice for what kind of provider they want to treat their conditions. For any type of condition that is covered under a policy, such as low back pain or shoulder pain, clients can see any type of provider that is licensed to treat the condition. Want to see a medical doctor about it? No problem. A massage therapist? Just as easy. How will this affect massage therapists? As you can imagine, an increase in choice for our clients is great news for us as well. No longer will a client have to cancel her doctor-prescribed massage just because she can’t afford the out-of-pocket price. If insurance if going to cover treatment for a condition, it will cover all qualified treatments, just as long as the treatment is within the providers’ scope of practice and the provider is licensed or certified by the state. If your state does not yet allow massage therapists to join insurance networks, that will soon be changing. Not every massage therapist will be able to join every network, but insurers will have to contract with enough therapists to serve any given region. Once in-network, therapists will be able to bill insurance directly and receive reimbursement for massage treatments. Clients will only be responsible for a small copay or coinsurance, which means that they will be able to come in more frequently to receive needed treatment. What if I don’t want to take insurance? If you don’t plan on taking insurance in your massage practice (or if you only take PIP insurance), this new law will not affect you at all. Just as some providers will not want to deal with taking insurance, many patients will not want to bother with finding covered providers. There will always be a market for cash massages, and the Nondiscrimination Provision will not be taking any clients out of that market. Rather, this law will increase the demand for massage in general, both as a relaxation tool and as a medical treatment. We need help from all levels of the industry to make sure that the Section 2706 gets implemented correctly in every state. Please go to the Integrative Healthcare Policy Consortium (IHPC) site to find out how you can be involved and take action. Your efforts will help to determine the future of the massage profession. Thanks for being a part of this! 2706: It’s the law and it’s worth defending. Let’s make it work!